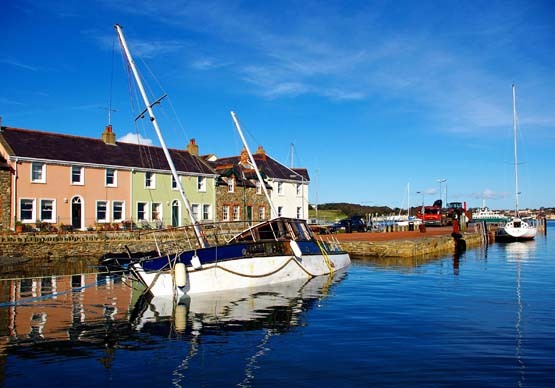 Strangford is a quaint fishing village at the entrance to Strangford Lough. The Vikings sailed into the lough and noted its strong tidal currents hence the name ' strong fjord'. There was a port her as early as 1205. As in other parts of Ireland, piratical raids eventually gave way to settlement and Strangford, with its sheltered anchorage for ships, became a port of some importance in the early middle ages. But trade was not always peaceful and the needs for security is illustrated by the building of tower-houses , such as that of 16th century Strangford Castle which dominates the harbour. It was in ruins for a period in the 16th century but was restored and strengthened during Queen Elizabeth’s reign. In 1514 King Henry V111 granted Strangford and Ardglass and the customs duties payable by the merchants who used their ports, to the Earls of Kildare, who already had substantial property in Lecale. This began a period of great prosperity for Strangford during which the village took on its present circular shape at the western side of the entrance to the lough. Valentine Payne, agent to the 16th century Earl of Kildare, was particularly active and wrote to his employer in 1629;" I have builded a chapple from the ground for your Lordship. I have likewise builded a key where there was none before, that the biggest shippe the king hathe may lay her side by it. Besides I have builded a custom house and have bestowed in other buildings above , above 300 pounds." By the 18th century Strangford had become an outport for Downpatrick for though Edward Southwell, proprietor of the Manor of Down, had built Quoile Quay in 1717, it was inaccessible to large ships. The Collector of Customs resided in Downpatrick, but the close relationship between him and some of the local merchants was believed to deprive the government of revenue, and the office was moved to the Old Quay in Strangford. Things may have improved but the fact that Collector Norris was able to build the elegant Strangford House, aroused suspicions in his day and our own. Despite its importance as a port, Strangford remained a small village, and Bishop Pococke, who visited it in 1752, described it as consisting of " little more than one small street, the buildings of which are mostly on the upper side." This continued to be so, even in the early 19th century, when its overseas trade exceeded that of Ardglass and Killough combines and it ranked 8th among Irish ports in the tonnage of ships registered. In the 1830s the writer of the Ordnance Survey Memoirs for the parish of Ballyculter, is not impressed by its appearance. "The town is by no means a neat one, but picturesquely situated, if observed from the opposite side of the water. One the one side of the principal street there is a row of good houses, on the opposite a collection of wretched fishermen’s cottages and corn store." There was a corn mill here in 1836 and the town was owned by Lord De Ros . The Poor Law district population was 2778 in 30 Nov 1839 with the town's population under 600 with 119 houses. By 1837 the population was said to be 2221 people. Lord de Ros was concerned about the effects of the Famine and instigated food relief and works programs for the villagers in 1847. (LM 1989 p36) Public works program was instigated 27 May 1848 for famine relief work to upgrade road from Downpatrick to Strangford (FCD p 9). 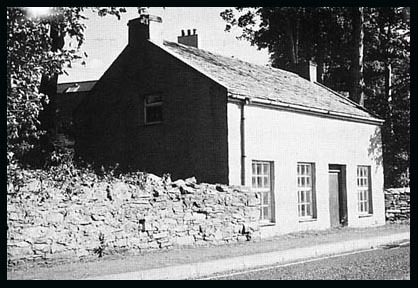 Photo of almshouse in Ballyculter Upper available (LR 2011 p52) Dr. MacLaughlin reported in 1893 that a bad nuisance (he was worried about cholera) existed at the slipway at Strangford in the shape of a latrine. Lord de Ros replied that his father had built in c. 1868 and although it was on his land he denied responsibility for imporving it. The matter was refered to the dispensary. The corn stores were soon not needed, for, when ships increased in size, Strangford lacked the deep water facilities of other ports, while the absence of a rail link put it at a disadvantage compared to Killough and Ardglass. A measure of the effects of these developments was the fall in population from 620 in 1815 to 338 in 1926. In recent years the decline of Strangford has been arrested but the port has not revived and the coal and potato boats which for years served Elliott’s and McMullan’s and brought life and colour to the village, are remembered now only by the older residents. The car ferry which links Strangford and Portaferry gives greater access to the Ards and North Down but other shipping at the quays is confined to yachts and small fishing vessels. Click here for information on schools here in 19th century. This is the main street of Churchtown. The parish church and graveyard is on the corner behind me. This church is in the townland of Ballyculter Upper which is in the present-day village of Churchtown. The first mention of the Ballyculter parish is in 1306 (Catholic). There had been a church on this site in medieval times, dedicated to St. Malachy and called Kilmalock, which united with Saul parish in 1622 then became a ruin. The original church was built in 1629 by Valentine Payne and there is an inscription on the bell to Elizabeth Payne, wife of Valentine . By 1657 it had been repaired, possibly by the Ward family who had established themselves at Castleward and felt obliged to provide a church for their visitors and employees on the estate. A lease for the ground was issued by Cromwell Ward of Downpatrick in 1663. The old graveyard of St. Malachy's would have been used for some time after its ruination. In 1710 Rudolf Lambert, Dean of Down, donated a silver chalice. A tower was added to the church in 1723 and a steeple, at Lord Bangor's expense in 1777, he also placed a ornamental wainscot around the communion table. 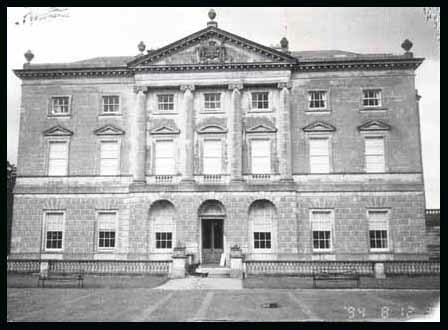 In 1723 it was described as as spacious and handsome structure. Redmond Morris donated two copper collecting pans in 1754. The curate in 1773 was Rev. Edward Smyth who astonished everyone by becoming a Methodist minister. In 1814 the gallery held only 12 pews and in 1819 a bell was purchased at a cost of £70.1.7 . This proved unsatisfactory and another was bought by Edward Ward Esq. A new font was erected in 1825 made by William Ardiss of Strangford, at a cost of £5.10.0. The roof was slated by 1825 and the church was whitewashed inside and out. In 1835 £ 450 was spent on repairs with some of the money granted by Ecclesiastical Commissioners. The lych gate, built in 1888, a gift of Admiral Ward, is a distinctive feature of the church. It's a roofed gateway where the coffin awaits the arrival of the clergyman for the funeral service. Electricty was installed in Oct 1954, a gift from Mr. & Mrs. Samuel Orr. This Trinitarian meeting house was built in 1845 after a suitable site was rented from Lord de Ros at a nominal 10 shillings a year. Dr Henry Cooke officiated. It's first minister was Rev. Thomas Irvine but he resigned in 1864 and was replaced by Rev Aaron Wilkie. He resigned in 1868 and was replaced by Rev Robert Elliott Fleming. The average congregation in 1870 was only about 30 people. In 1878 the minister was Rev Patrick William White, then by 1881 it was Rev Robert Taylor Bailey who enlarged the congregation to 60 and undertook extensive renovations costing £75. Rev Bailey resigned in 1887 and was replaced by Rev Robert Allen Beatty who stayed 34 years. On his retirement in 1923 the church shared a minister with Ardglass, Rev William Moore Cargin until 1932. The church closed in 2003. Subsequent shared ministers were Rev Walter Entrican 1933- 1947; Rev Adam Colhoun 1947-1950; Rev William Thompson Agnew 1951- 1971; Rev William Trotter 1972-1986; & Rev Tom Long 1987- 1995. The church closed in Dec 2003 when the congregation dwindled to 8. ( DR* 10/12/03) I have indexed the marriages 1848-1900 throughout the Surnames Index (LR 2005 p66-68). This church is now closed. There were several Methodist chapels in the parish over the years. One was erected by Mr. George Moore in 1804 with an itinerant lay preacher Mr Averill attending. Another Meeting House was erected in Strangford in 1812 to handle the large congregation. There is no evidence of these buildings today. A chapel or Meeting House was erected in 1833 at an expense of £100 which was raised by contributions of the congregation. In 1836 it was described as very plain and out of repair but not enough money to pay for the repairs needed. The money from the collection was barely enough by pay for lighting the church. There was enough seats for 138 people with an average attendance of 30 people. The Primitive Methodist Meetinghouse was next to Constabulary Barracks in 1863 but closed in 1880, changed it name by dropping the "Primitive" and moving to Castle Street. This chapel was built in 1820 on a site given by Lord Henry Fitzgerald and built at his expense with an extra £10 a year for expenses. Before this Catholics in the area celebrated Mass in a store on Newry Quay in Strangford belonging to Samuel Norris Esq. Lord Henry gave an annual donation of £10 on consideration of being allowed two seats for the use of his visitors and servants. In 1824 he erected the ornamental crosses. In 1836 it was described as a plain building with a slate roof and 5 small windows, 5 seats and a mud floor. It was later described as a fine single-storey building. Rev. MacGowan bought land from de Ros Estate for £120 to build Stella Maris Hall which was opened 27 Dec 1926. This chapel was destroyed by fire in Sept 1930 by a careless altar boy and replaced by the present building in 1932. This chapel is in Cargagh townland and is known as Drumroe. It was one of the five Old Mass Houses reported in 1731. It was originally built of mud, packed with stone and with a mud floor. It was thatched with reeds & sprigs from the bog. It was described as a square building with no vestry attached. The priest put his robes on behind a screen and when it rained the roof leaked and made puddles on the earthen floor. People sat on wooden forms. It was replaced with stone in 1743. Rev Patrick Starkey then rebuilt it in 1854. The outside porch at the roadside was built sometime later and a gallery erected after that, as the congregation grew. 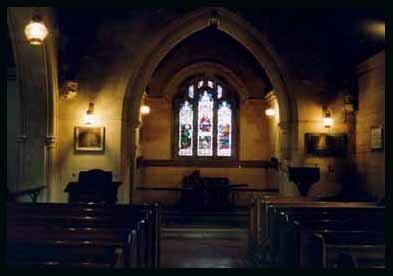 The gallery and three windows in the west side of the church were made by James McConville of Drumroe. The seats were made by Tommy Curran and the earthen floor was replaced with wood. Throughout the years following 1800 Cargagh had Sunday Masses on Christmas Day and Easter Sunday and evening devotions in May and October and Holy days. The parishioners would have walked to attend Mass. The Pads of footpaths around Cargagh are many e.g. Ballynarry, Drumroe, Ballylena and Cargagh lane. There isn't a graveyard attached as burials are still in the grounds of the old ruined St. Malachy's in Kilclief parish. PRONI & NLI have baptisms 1844- 1864 & 1870- 1880, marriages 1843- 1880; no graveyard attached. Raholp church, less than 3 km from Saul is one of the oldest ecclesiastical buildings in Ireland and was dedicated to Bishop & St. Tassoch, a metal-worker and bishop, who administered the last communion to the dying St. Patrick. It was referred to in a document written in 1210 and again in papal taxation rolls of 1306. It was locally called Church Moyley. By the early 17th century it was recorded as a ruin. Basic restoration work was carried out in 1915 and again in 1990s. This photo was taken after the building was restored. It was a very small church, built of rough stones held together with clay instead of mortar and the eastern window is surmounted by a lintel and not an arch. There was a graveyard nearby and an ancient well. It was the archetypal early Christian church in Ireland for several centuries. It is now easily reached from the Banaghan Road, just outside the village of Raholp. The ancient church was built by Valentine Payne, agent to George,16th Earl of Kildare in 1629 to which a tower and chancel were added by the 23rd Lord de Ros & the chapel repaired in 1740. The church was the private chapel of the de Ros family but a public one in that the local people have always been encouraged to attend it. Strangford people were buried in its graveyard. At one time all denominations attended it and, for a time it was the only surviving church in the district, Ballyculter and Kilclief both being in ruins. It has never been closed for worship in the 350 years it has been open. Valentine Payne presented a bell to the chapel as a memorial to his wife Elizabeth, in 1629. William Lennox Fitzgerald, grandson of the Duke of Leinster, became 23rd Baron de Ros in 1839 and inherited the port and village of Strangford, which he decided to make his principal seat in Ireland. In 1844 he built Old Court and surrounded it with pleasant walks and gardens. Lord de Ros also made many improvements, extended Payne's chapel at Old Court and built Katherine Quay as his own private harbour. The family was popular with the people of Strangford and there was genuine sorrow when the house burnt down by the IRA. House & estate of 522 acres. The area around the estate was originally called Carrick na Sheannagh. It was owned by the Ward family in 1602 who bought it from the Earl of Kildare. The Wards came to Lecale in 1570 when Bernard Ward of Cheshire, on being appointed Surveyor- General of Ireland, settled near Strangford and purchased three townlands from the Kildare family. The tower- house in Strangford (see top photo) was built by Bernard's son Nicholas, probably in early 18th century. The family continued to live in it until this modern Castleward house was built c. 1760 by Bernard Ward, later Viscount Bangor . story about life 'below stairs' in 1945 or a poem written about the estate by J.W. Montgomery of Downpatrick in 1884 available (Inv). This photo shows myself standing inside the one of the dual court burial chambers which are shaped like a boat. The other chamber is to the right of the photo and continues the same line as the first one. This trapezoidal long cairn has its sides revetted with dry-stone walling and has a shallow forecourt at each end opening into the four chambered galleries. The chambers are surrounded by a stone wall. At this burial site the bones of 34 people, partly burned, have been found in the two chambers. Flints and decorated pottery were enclosed in the grave and also the skull of a horse which precedes any other known hors remains in Ireland by 2000 years. The first inhabitants of the Lecale district are thought to have arrived around 6000 BC. They colonised the shores of Strangford Lough where games was plentiful and they lived by hunting, fishing and gathering food. The pattern of their settlement and life style is illustrated by the finds of flint tools and kitchen middens of bones and great heaps of shells. Rises in the water level in subsequent years have probably covered much more evidence. Gradually basic agriculture developed and by 3000 BC there is evidence of the domestication of animals and shifting cultivation. These early farmers were attracted to the light soils of the Lecale area. Their distribution is marked by the remains of these stone graves.